Mountain Biking is one of our most favorite things to do in Costa Rica. Costa Rica has several significant regional and international races each year, and the Ticos are quite serious about this sport. The terrain that covers the country includes rocky volcanoes, dirt roads, roaring creeks, and forests, making Mountain Biking in Costa Rica an adventurous treat. “ La Ruta de Los Conquistadores” is the most grueling and the most well-known annual race. People from all over the world travel to take part in this “Route of the Conquerers. The route is so maned because it retraces the steps of 16th-century Spanish conquistadores from the Pacific Coast to the Caribbean Sea. The most brutal part is that this is all done four days during the rainy season – usually taking place in mid-November. One of the best ways to explore Costa Rica is by bike. It is cheap, respectful to the environment, and you can reach hidden locations to see an exotic menagerie of animals and birds like kingfishers, quetzals, macaws, iguanas and more. Taking one of the mountain bike tours will give you the opportunity to learn about the indigenous animals and plants from experienced naturalist guides. Do you need some inspiration? Here are some of our top picks! The Arenal Tour starts in La Fortuna and goes all the way around Lake Arenal to finish by the dam on the northern side. This tour is 18 to 25 miles long and is suitable for Beginners as well as for Intermediates. Beginners should be prepared for the 600 meters climb, however, but in general it is quite doable. The trails will take you through rivers and streams, down canyons and up the steep valleys. Then cycling around Lake Arenal with a view of one of the most iconic volcanoes of Central America, the active volcano of Arenal. Don’t miss some of the Tours of Arenal Volcano Park while you are in the area. Make sure you finish your day at one of the many hot springs for some well-deserved relaxation. This race is more about finishing it than winning it. It follows the steps of the Conquerors of the year 1560. Juan de Cavallon and Perefan de Ribera discovered Costa Rica and fought their way through the forests and mountains of Costa Rica. But while they were on horses, the competitors are on their bikes racing from the Pacific Coast of Costa Rica all the way to the Caribbean. The trials wade through valleys, up the mountains, passes, jungles, volcanoes and pristine beaches. Along with wet and slippery paths, there are hanging bridges and rivers to cross. Sometimes the bikes have to be carried when the rivers are too high! The scenery is sensational but only the dedicated, tenacious and high-spirited minds should undertake such an arduous journey! The Ruta de Los Conquistadores is considered to be one of the ten toughest endurance events of the world. When riding bikes on the Costa Rican roads, you are not always in for a safe journey. The road conditions can be challenging enough but if you add aggressive drivers to that, it gets a little risky at times. So, it is good to be informed about the best rotes to take. If you want a relaxing bicycle ride with plenty of wildlife spotting, there is a 13-kilometer section of flat paved road between the small Caribbean beach towns of Puerto Viejo de Talamanca and Manzanillo. On your way to hit the various towns, there are some places where you should pull over to admire the sheer beauty of the jungle and ocean. Places like Punta Uva, Cocles Beach, Playa Chiquita and the Jaguar Rescue Center should be on that list. Along the paved flat road, with the exception of one small hill, the observant bicycle riders will be able to spot different flora and fauna as they pedal through the giant rainforest that runs parallel to the ocean. There are a couple of stores, mini marts, and Caribbean hotels nestled in the jungle along the way in case there is a need to have a drink or a bite to eat. The ideal time to start riding your bike in Costa Rica is in the early morning. This is the best time to expect clear weather, even during rainy season. When cycling by the Caribbean coastlines, you are far more likely to spot wildlife than if you do so by the pacific coastlines in areas like Guanacaste or the Nicoya Peninsula. Guanacaste Costa Rica may be the best province to explore by car while Limon and the Caribbean side, is a dream to discover on a bike. If you keep a keen eye on the surrounding trees, you can see monkeys and even toucans. Along the Puerto Viejo – Manzanillo Costa Rican bike ride you should pay special attention to the Cecropia trees. Cecropia trees are easy to recognize and can be found everywhere. They have a thin main trunk radiating a few small branches with large hand-shaped leaves.Locals call the tree Guarumo, and the leaves are a favorite snack for sloths and iguanas. Manzanillo has beautiful, soft white sands and coconut palm trees for shade. The beach is ideal for sunbathing and snorkeling, especially during the months of September and October; March, April, and May aren’t bad either. The Gandoca Manzanillo Wildlife Refuge is a beautiful place to set aside the bike and walk through the jungle, although it’s only recommended to do so with a guide. 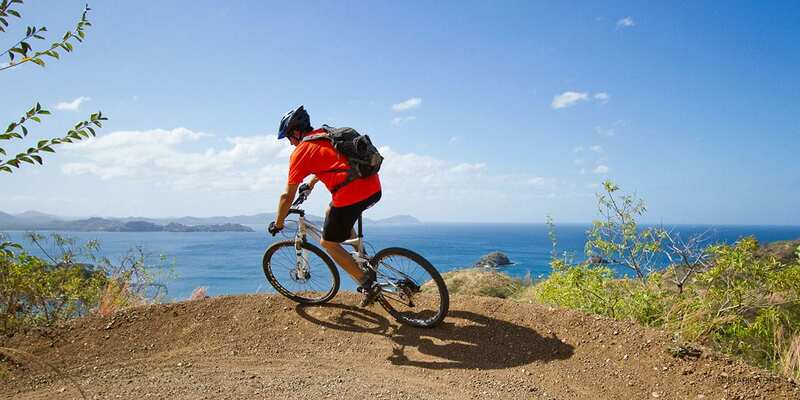 A mountain biking trip in Costa Rica is the perfect holiday adventure. Let us help you plan it!